Difficulty: Easy. Flat hard packed gravel trail. From the junction of Routes 7 & 202 in New Milford head north on Route 7 for 2.3 miles. Turn right on Boardman Rd and cross the river. The parking lot is on your left. A secondary parking lot is located back across the river off of Route 7, however, the old footbridge over the river is closed, so you'll have to cross the Boardman Bridge. To access the River Road parking lot; Continue along Boardman Rd and take your first left on River Rd. Travel just over a mile and spot a dirt road on your left that leads to the parking lot. The New Milford River Trail follows the Housatonic River corridor in the town of New Milford. Currently the southern section of the trail is off-road, while the northern section follows a low traffic dirt packed road up to Gaylordsville. For more information visit; NEW MILFORD RIVER TRAIL . Starting from Boardman Road parking lot; Head past the gate into Saga Meadows Park along an old paved road. Cross over the RR tracks where the trail surface changes to hard packed gravel. 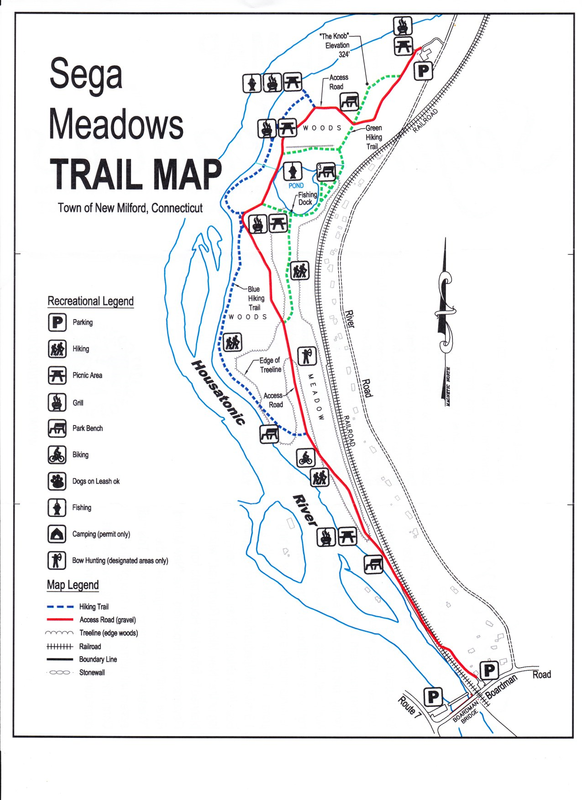 The trail travels between the Housatonic River and RR tracks for a bit before pulling away from both and traveling alongside a meadow. Take a sharp left into a Pine forest at 0.6 miles. Follow the signs. You'll hang a right with views of the river below and pass by a small pond. Note; A spur trail takes you alongside the pond which has a dock and benches. Hang a left at the next intersection following the "bike trail" sign. Continue straight at the next intersection up a slight knoll. At your next intersection continue straight past the gate to the River Road parking lot. Sign board here. If you head out the dirt road you'll come to River Rd after 1.3 miles. Note; You can head left on-road along this very low traffic hard packed dirt road to extend your ride. It travels between the river and RR tracks, is wooded and isolated. After 2.9 miles the road becomes more residential and turns into Riverview Rd before coming to Route 7 in Gaylordsville after 3.6 miles.